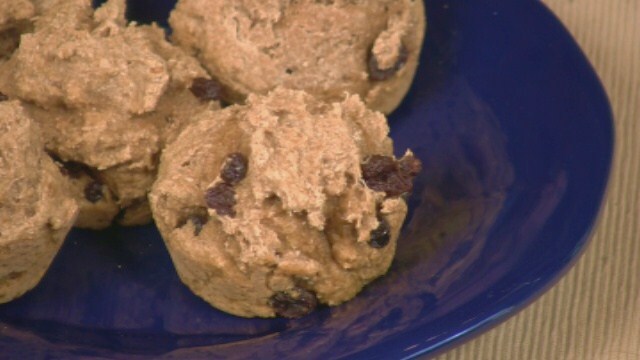 These delicious, low-fat muffins take just thirty minutes to assemble and bake. Plus, they don't use eggs or butter, which eliminates a great deal of unhealthful fat and all of the cholesterol. Preheat the oven to 375 degrees F. Lightly mist 10 muffin cups with vegetable oil spray. Combine the flour, sugar, cinnamon, baking soda, nutmeg, and salt in a medium bowl and mix thoroughly. Combine the applesauce, soy milk, oil, molasses, and vinegar in a large bowl and mix thoroughly. Add the flour mixture and stir until just combined. Stir in the raisins. Spoon the batter into the prepared muffin cups, filling them about three-quarters full. Bake for 15 to 20 minutes, or until a toothpick inserted into the center of a muffin comes out clean. Stored in a covered container in the refrigerator, Applesauce Muffins will keep for up to 3 days. If longer storage is needed, freeze the cooled muffins in heavy-duty zipper-lock bags for up to 1 month. Defrost at room temperature or in a microwave. Variation: Add 1/4 cup of chopped walnuts to the batter and/or replace the raisins with 1/2 cup of dried cranberries.